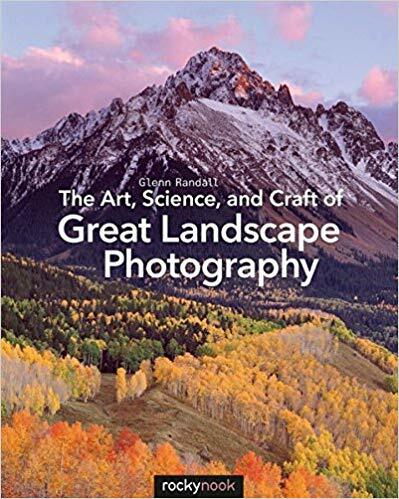 Great book on landscape photography, for novices and intermediate photographers alike. For scouting, look for areas with a compelling foreground that integrates seamlessly with a strong mid-ground and background. The wind is often calmest right at sunrise. The smaller the body of water, the better the chance of a perfect reflection. For searching for flowers, density trumps breadth. A small dense patch is better than an expansive less dense grouping. Most good landscape photographs are made early or late in the day (blue/golden hours). Frontlighting, where the light comes from behind you, will make the subject look flat. Sidelighting better reveals the contours of the land. Backlight, with the light behind the subject, can add drama by rimlighting your subject. The best “glow” lighting typically occurs 15-30 minutes before sunrise or after sunset. They can only appear when the sun’s elevation is below 42* off the horizon. To predict a rainbow, face your shadow, and put your hands out in front of you with thumbs touching and your left pinky in your shadow’s head. Decide what elements you want to include in the scene and exclude everything else, get close and keep it simple. Most beginners make the mistake of including too much irrelevant clutter around the main subject. Don’t un-center the subject just to play by the rules, make it make sense. If there’s no reason, then make it a full-frame shot. Another beginner’s mistake is to allow some distracting trivia into the shot. Watch out for branches and such, check your edges! Context is also important: A very tall peak can be helped by having some of the shorter peaks around it. Typically don’t put the horizon right in the middle, either ⅔ sky or ⅔ land. Using a wide angle lens with flowers right in front of you will help enhance the depth of the field. To create an image nicely focused throughout the frame when you have something really close and some stuff really far… take a few photos on a tripod at different focuses then consult the book for combining them. You can combine photos in photoshop, just be sure the exposure settings are all the same. You need the camera in manual mode to keep it consistent. Eyes will first go to the lightest tones of a photograph.